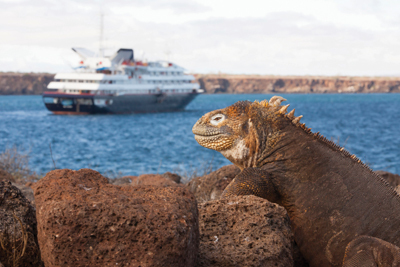 (Ft. Lauderdale, FL -- March 4, 2015) Silversea is making it easier than ever to discover the wonders of the Galápagos by introducing air and land package fares for Silver Galapagos expedition cruises. The program is available for new bookings made on or after March 4, 2015 on any of the ship's year-round Galápagos sailings. The package includes: roundtrip economy class air between Ecuador and the Galápagos Islands; a two-night pre-cruise hotel stay with breakfast at the Quito JW Marriott; an evening tour of Quito's historic city highlights; transfer from the hotel to the airport in Quito; pre- and post-cruise transfers between the airport and Silver Galapagos in Baltra; a post-cruise hotel day room at the Hotel Oro Verde in Guayaquil (for guests with flights after 10 p.m.); transfer from the airport to the hotel, and from the hotel to the airport in Guayaquil; Galápagos National Park and Ingala Transit Card fees; and porterage fees. The cornerstone of these vacation packages is, of course, Silver Galapagos and her award-winning all-inclusive experience. Recently recognized for having the "Best Shore Excursions" in the small-ship category of the "2015 Cruise Critic Cruisers' Choice Awards," the 100-guest, all-suite ship features complimentary exploration activities that include Zodiac tours, snorkeling, kayaking and nature hikes led by highly experienced guides certified by the National Park of the Galápagos. And aboard ship, guests enjoy such Silversea hallmarks as the pampering attention of a butler, sumptuous gourmet cuisine, and complimentary champagne, wines and spirits served throughout the ship. "With these new all-inclusive air and land packages, designed with the highest levels of comfort, convenience, and value for our guests, the award-winning Silversea experience continues to be the perfect choice for travelers seeking an enriching holiday in the exotic Galápagos," said Kristian Anderson, Silversea's senior vice president and general manager for the Americas.